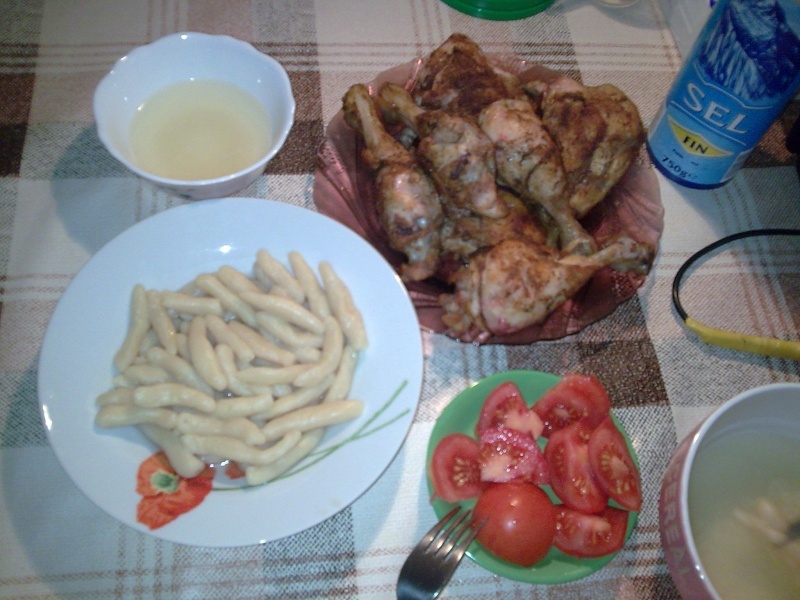 First we have to boil chicken or beef or lamb.But this time I`ve used fried chicken.When meat is ready,take it out. Water+salt+flour= dough. It`s very easy.)) Dough should not be too soft. Then,if you boiled meat or chicken,you need to keep that broth,because normally dough is cooked in that broth.But as I told you I fried chicken,that`s why I`ve just boiled plane water with broth cubes.Take aside 2 cups of broth,chop 4-5 garlic cloves in it,a little bit salt and mix it. Then boil them in the broth for about 15 minutes,put aside in a dish.Serve it with a cup of garlic broth and chicken. Masha Allah looks yummy and easy to do. Something I will try Insha Allah. That does look very tasty dear sis. Insha'Allaah, I will try to make it.